Peter Wharton is something as unusual as a non-american running a tour group in the States: StormGroup Chasers. His tours are unusual in many ways as well as he doesn’t run them as a company, they are completely non-profit but more of a gathering of friends chasing storms together. You live in New Zealand. What do you do back home? Do you have family? I’m retired, and organising this annual storm chasing adventure with a group of like-minded people is one of my major hobbies. My family, apart from my wife in New Zealand, is scattered around the world – Australia, Canada and Norway. Do you ever get any tornadoes or significant water spouts in New Zealand? Tornadic events in New Zealand, only occur few times each year, and very fleeting and usually low end EF-0 or EF-1 – having said that there have been a few unfortunate fatalities over the years I’ve lived here. The location where we built our home in Pt Chevalier was hit by the tail end of a small tornado, on the day we went unconditional on the purchase of the land – seemed like a good omen. How did you end up chasing storms in the USA? I’ve been fascinated by weather since my childhood years, and thunderstorms – especially lightning. I avidly watched the 3 volumes of Tornado Video Classics on VHS tapes, and then in 2002, I fulfilled a dream and signed up to a commercial tour in the States for 10 days. How many years have you been chasing now? I’ve been chasing severe weather ever since I started driving for the commercial tour group after 2002 – so 16 years. How did your interest in chasing storms turn into starting StormGroup Chasers? I thought I could provide a more personalised storm chasing experience than the large, multi-van commercial tours, so I launched StormGroup Chasers in 2011 inviting a small group of chasing friends to join me. StormGroup Chasers is just a convenient name for a group of chasers I’ve met over the years, simply a way for me to organise and share the costs of storm chasing between the members of the group – a few new people join us each year, and many in the group return each year without fail. I wanted to organise on a non-commercial, personalised basis, so we’re heading out as fellow chasers, not in a business/customer relationship, and not as a large commercial profit-making enterprise. I really enjoy sharing the unique experience of severe weather on the Plains with a group of like-minded people. Your 7 day and 10 day tours have the lowest price on the market. Is everything included in those tours, compared to other tours? The costs of the tours on the web site include all costs of the tours, other than transportation to/from the base city in Oklahoma City, and personal food and drink. Hotels on the road are paid for by each guest each morning at checkout, and the average cost of these rooms is included in the total tour costs outlined on the web site. Do you seem to have a certain (demographical) selection of tour guests on your tour? The tour guests are an Internationally diverse group of gender, age, marital status <with a few couples> – making it a great opportunity to meet interesting people – we all share the same thing – a sense of adventure, a love of severe weather and the discovery from a chase/road trip on the Plains. You tend to sell out quickly and have a waiting list for your tours. How early do you have to sign up to make sure you can go on a tour? Usually only a few seats are available after the initial offering to previous guests, in September each year. I then post the remaining seats on the web site/media channels/email contact list. Which three words would best describe your tours? What is a common reason why returning customers tend to return to your tours? What kind of benefit do you think there is of not being an American – in terms of storm chasing? I’ve always said that it’s essential to “keep a beginners mind”, i.e. never get jaded about storm chasing – being a “tourist” each year helps me to keep a fresh perspective on touring the Plains. What is your primary objective while chasing storms? Delivering the best overall storm chasing vacation experience for my fellow chasers. Which has been your best chase day to this date? Which are your favorite areas to chase in? West Texas/New Mexico/Texas Panhandle/Eastern Colorado/Western Kansas – not just for the severe storms, but the scenery. Are there states/areas you avoid no matter what? Heading east of the Oklahoma state line is always challenging, but I’m pretty much prepared to go anywhere for severe weather. Did any specific storm have a significant impact of you as a person or storm chaser? Joplin, MO on May 22nd, 2011, and El Reno, OK on May 31st, 2013. What is the best thing about storm chasing? Worst thing about storm chasing? What is the first thing you do when you get back home after chasing a full season? 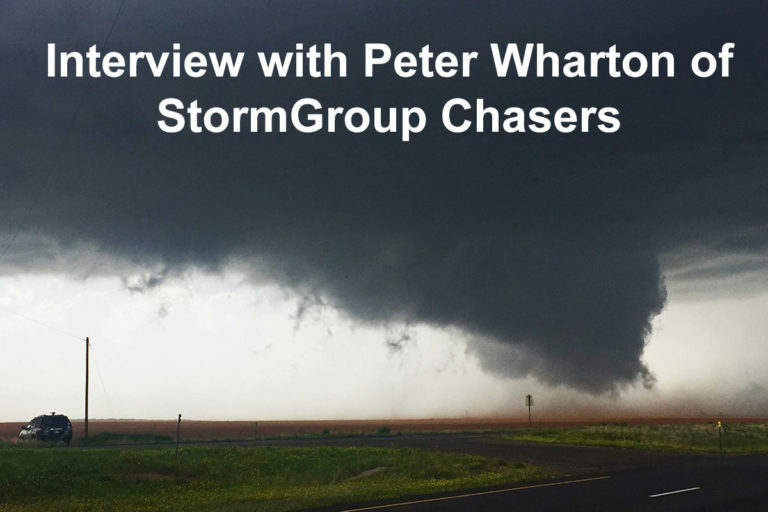 Edit 2019-03-15: If you are interested in chasing with Peter Wharton and StormGroup Chasers, they currently have two seats remaining. One on Tour 3 (late May, 10 days, $2.675) and two seats on Tour 6 (late June, 7 days, $1.850). These are the lowest priced 7 and 10 days tours on the market! You can book these seats on StormGroupChasers.com.